According to Statista, in the next two years, we’ll see a rapid growth of the Internet of Things technology that is likely to take over in different industry verticals. The International Data Corporation (IDC) predicts, that IoT spending is forecasted to experience a compound annual growth (CAGR) rate of 13.6% from 2017 to 2022 to reach $1.2 trillion. Therefore, MobileAppDaily, an online platform and a growing community that shares insights on the mobile app industry, performed comprehensive research of IoT development providers worldwide and shortlisted the top companies based on their ability to deliver outstanding results for businesses. Intersog was named among the global leaders who provide efficient IoT solutions to enterprises and startups. To evaluate the top IoT developers, MobileAppDaily used a complex methodology, including an assessment of the quality of work, customer reviews, marketing presence, and case studies. For over 13 years, Intersog has been helping businesses to overcome their challenges and stay ahead of the competition by building custom IoT applications for funded startups and Fortune 500 companies. Throughout 2018, our company has strengthened its position as a global leader in the IoT space, helping our worldwide customers optimize operations, connect systems, integrate data, and improve customer engagement. Check out some of our IoT and Connected Car solutions here. We want to thank our clients, who trust us with their IoT development projects. We will continue improving our work and adopting new technologies to help our customers move forward. 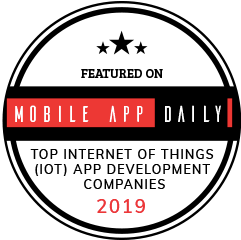 To see the complete list of Top IoT App Development Companies 2019 visit MobileAppDaily’s site.